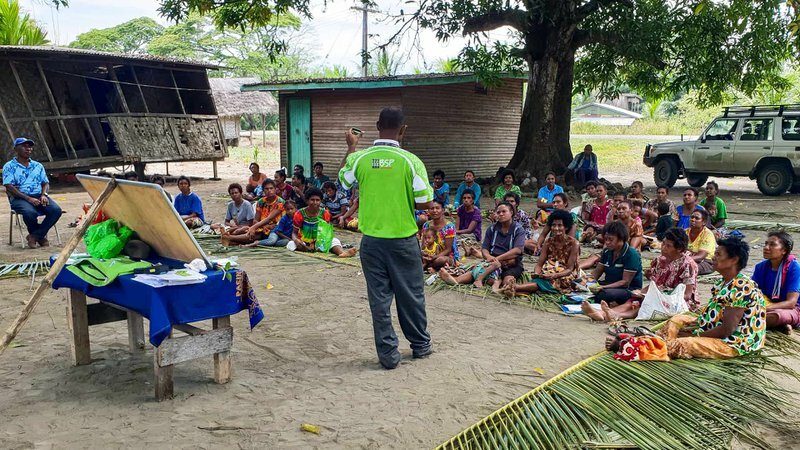 Bank of South Pacific (BSP) was invited by PNG Biomass to offer financial literacy training to communities in the Markham Valley, with a special focus on empowering women. As part of its community development plan, PNG Biomass aims to introduce communities without much prior financial experience and knowledge to the basics of money management and banking. The BSP Financial Literacy Program is a great fit as it is specifically designed for remote communities. BSP trainer Briske Kaume conducted an hour-long financial literacy training at Chivasing village for over 50 women. “During the training I discuss a number of topics, including setting financial goals and creating budgets, setting savings goals, methods on how to increase savings, coping with emergencies, selecting the right savings options, developing and utilising a savings plan, and how to use mobile banking to your advantage,” said Briske. Upon conclusion of the training by BSP the participants were very excited about the new information and practical skills they learnt. Many women were ready to open their first bank account and pleased to have the opportunity to do so as BSP had brought the necessary materials to get the women started immediately. BSP and PNG Biomass will continue to run more financial literary and money management sessions throughout the Markham Valley in the coming months.